“Maybe Baby” We’ll See You….. Okay, not “maybe”. Let’s just say WE’LL SEE YOU at the Arcadia Theater on Saturday, May 19th at 7:30 pm. RAVE ON! 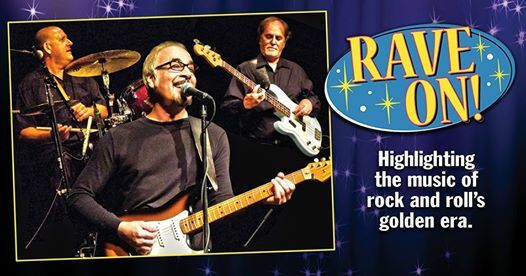 shows are high-energy performances of the best of rock & roll’s early years – like Roy Orbison, Buddy Holly and other greats of the era. It’s the timeless music that inspired The Beatles, Bob Dylan, Bruce Springsteen, and The Rolling Stones, to name a few, and continues to influence a countless number of today’s artists. This classic music gets the audience rockin’; young and old alike! It’s the music that influenced today’s artists, and it continues to appeal to people of all ages. RAVE ON’s! shows are always a crowd pleaser. What a Great day…..here’s what to celebrate! Today Is……..